Prairie Trail embraces the ideals of a truly sustainable community design exemplified in part by its walkability. It’s part of a comprehensive conservation design approach that makes the best use of existing topography and natural waterways while also adding stunning views. There are 13 miles of trails and 200 acres of parks in Prairie Trail. These common open spaces were designed to create a healthier environment and encourage people to be together. Research(1) has shown that green spaces with trees encourage people to be more social and where social ties are strong, people help and protect each other. 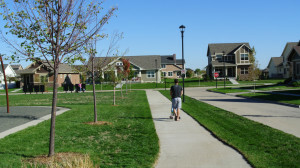 New Urbanism communities are also shown to equate to healthier lifestyles. The development is designed to be pedestrian-friendly with streets that range from gracious boulevards with planted medians to intimate neighborhood streets and rear alleys. Together with the integration of the green system of parks and open spaces and the trail system, Prairie Trail is one of the most walkable communities in Iowa.